Nothing says comfort food like a giant roast ham. Slowly roasted in your home kitchen with the smells wafting through the entire house. Does that thought make you salivate? Now add a touch of lemon and thyme to that mental image. Yum! This lemon and thyme sauce is very concentrated so when serving, make sure your guests know to pour it sparingly or it will overpower everything else on the plate. Blend all ingredients. Pat ham dry and cover with mustard thyme mixture. Bake at 350 for about 2 hours. 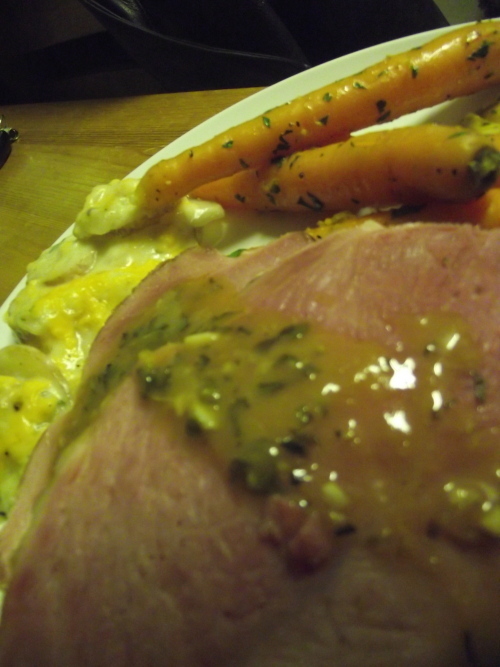 While the ham is resting, take the juice from the pan and reduce it until slightly thickened and serve with ham.